RAISE UR PAW NEWS: RAISE UR PAW FOR WORLD RHINO DAY! RAISE UR PAW FOR WORLD RHINO DAY! Today we JOIN THE CHARGE in Support of #WorldRhinoDay, Sept. 22,2015, where countless individuals and groups around the world will be not only showing their support for Rhino Conservation, and the 5 species of Rhinos - but also to raise awareness on the matters at hand that these innocent, beloved beings are facing. Although many are stepping up their efforts to save and protect these magnificent creatures from the ultimate fate... EXTINCTION, the crisis of RHINO POACHING is still threatening their survival. * Writing letters, Signing petitions, getting media attention. Every little bit of support will mean a great deal - because every voice is unique and can make a difference. REMEMBER -- Extinction doesn't just wipe the world of the beauty and life of beloved beings, but robs the generations of humanity of the beauty and life of these beloved beings as well. 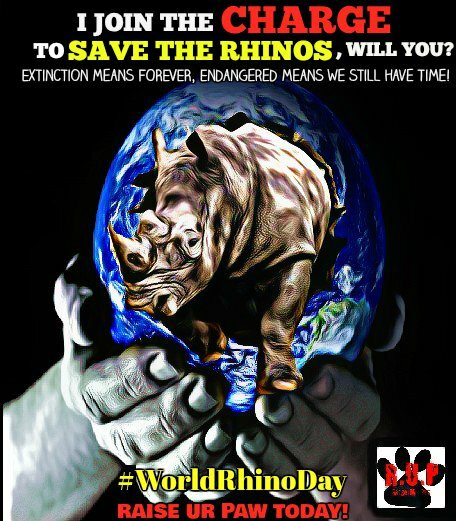 Please take part in the CHARGE to SAVE/PROTECT RHINOS, the stand we make today, is the difference that could be made tomorrow.